With this new version, you can also use an hardware controller to emulate mouse and keyboard. Therefore, with an hardware controller, you can play Android, Windows, Linux and Chrome OS games that support mouse and keyboard. Useful if you want play with hardware controller on games that not have controller support or support only the microsoft xbox controller. Stabilize shot when the option "Fast shot in FPS" is enabled. 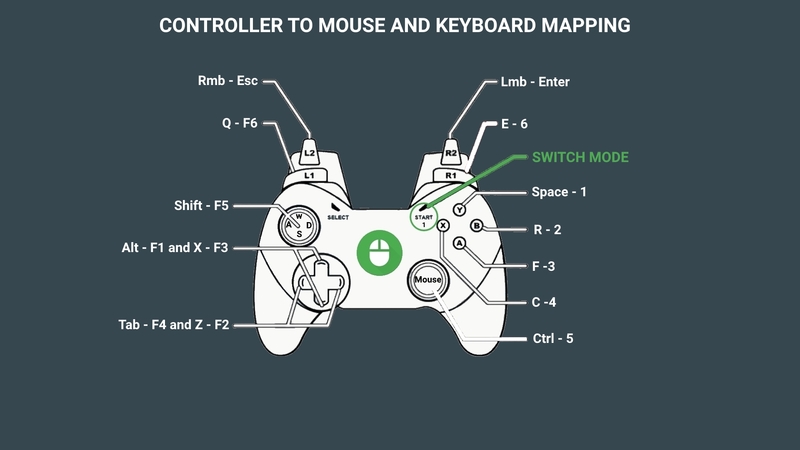 Bug fix on left stick when "Controller to Mouse and keyboard" is enabled and an hardware controller is used. Mouse left button moved on rigth trigger on all emulation modes. Support more hardware controller, precisly also controllers without analog triggers. Fix bug on CTRL + ALT + keys introduced with last update for my error. When you enable the accelerometer in the Client Settings and "Controller to Mouse and Keyboard" is active, now you can move the mouse like an airmouse in the gamepad tab. Was made for some games, not for normal mouse usage. bug fix on accelerometer listener when the app resume. Now you can change Air Mouse sensitivity in Mouse Settings. When an hardware controller is in mouse mode, some users prefer the mouse left button on the L1 button of the hardware controller. To make everyone happy, now you can use what you prefer, the right trigger or L1. Both buttons, when in mouse mode, act as left mouse button. The real story is that for UI navigation is more useful the L1 and for gaming is more useful the right trigger.